One of the things I love to do is make as much of our food as possible. We make our own sauces, jams, pickles, and preserves. We grow our own vegetables and fruit and freeze the left overs for later. We slaughter our own meat and have even made our own sausages (and have plans to have another go next week). It feels good to be self-reliant, and it tastes pretty good too. I’ve made several batches of mozzarella cheese now too. It’s not the kind of thing I make all the time, mainly because the cheese doesn’t last a long time – several days at the most. But with the school holidays giving me a little more time, I had another go. I popped a pic on instagram and facebook, and got several questions about how I made it, so here it goes. I have bought a mozzarella cheese making kit online. It contained some lipase (an enzyme that begins the souring process), rennet, calcium chloride, as well as a sterilising agent, cheese cloth, and cheese salt. It also came with instructions. You can google individual recipes, and source the individual ingredients, but I found the kit super easy. You also need a milk thermometer, a large pot, a microwavable bowl, and a sieve, as well as rubber gloves to knead the hot curds (it’s too hot to knead without the gloves). 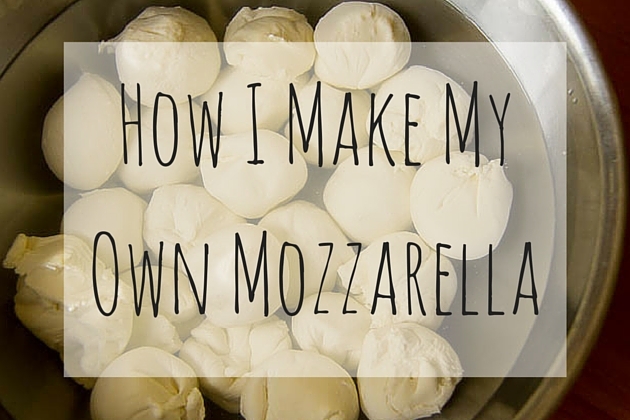 Making the fresh mozzarella really only takes about 30 minutes. 4 litres of milk makes enough cheese for pizza for the whole family. I heat the milk slowly on the stove, adding the lipase and calcium chloride, followed by the rennet. When the milk reaches 41*c the curds and whey separate, and the curds clump together. You then scoop out the curds using a slotted spoonand pop them in the microwave. Once they are hot, you knead them together, squeezing out and draining any remaining whey (wear gloves to protect your hands). After heating and kneading the curds several times, the cheese becomes smooth and silky and is ready to use. While it is still hot, I squeeze it into small boccocinis (bite sized balls) and drop them into cold water so that they set. We used the mozzarella to make pizza for dinner. In summer we make tomato salads with basil and fresh boccocini. This summer I may just try to make my own. Have you tried making your own cheese? Ever thought about it? My one attempt at making mozzarella, using the recipe in Barbara Kingsolver’s Animal, Vegetable, Miracle, was a disaster. Yours, however, looks fantastic. Do you find it to be cost effective? It costs less than buying the equivalent amount of fresh mozzarella. I love the idea of making our own cheese, although we haven’t given it a shot yet. This mozzarella kit sounds like it would be a great place to start! That looks delicious – and fun! might be self raising flour… but it is good to know how to make your own self too! I’d love to have a go at some other cheeses too. Finding space for any cheese that needs to ripen is a problem at the moment. I’d love to try Camembert or Brie because yummy!